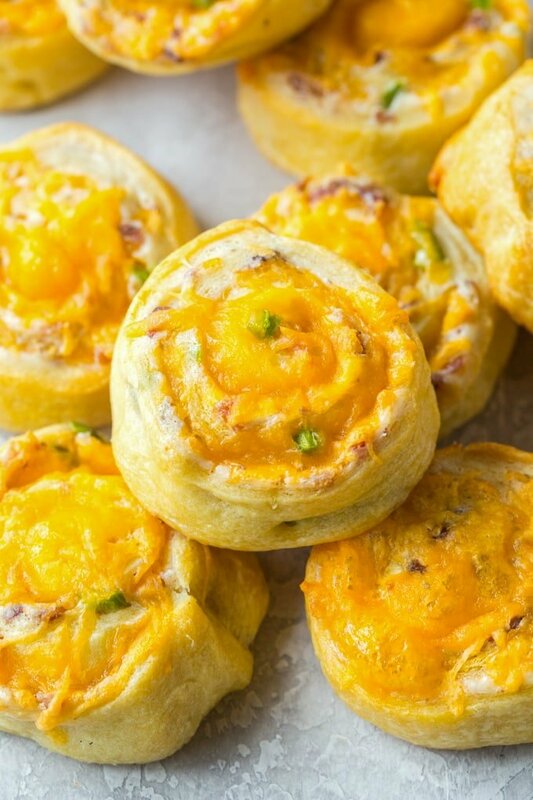 Easy to make by using refrigerated crescent rolls, these Bacon, Cheddar and Jalapeno Pinwheels are a perfect blend of savory and spice. 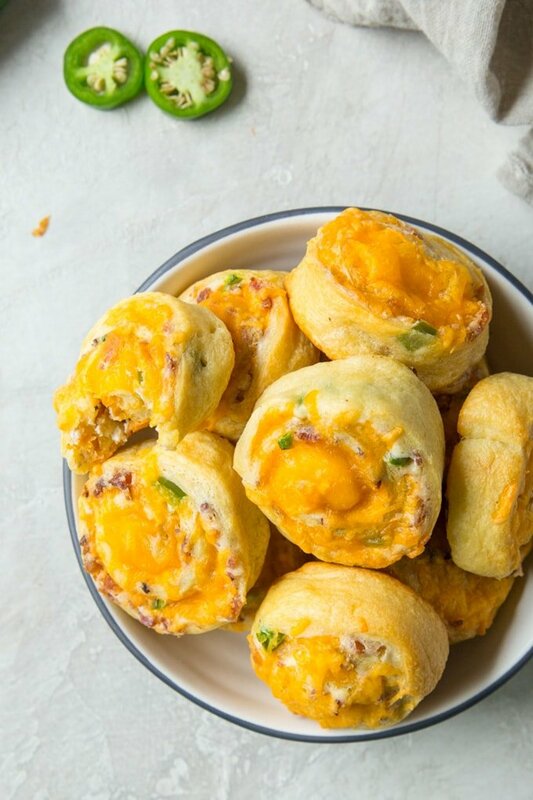 They are super simple to make and taste just like a Jalapeno Popper wrapped in a buttery, flaky crust. These pinwheels are a must-have for game day or any party. We love these serve up alongside our other favorites like Bacon Wrapped Chicken Bites and Fried Ravioli. Bacon, jalapeno and cheddar – such an amazingly delicious combination. 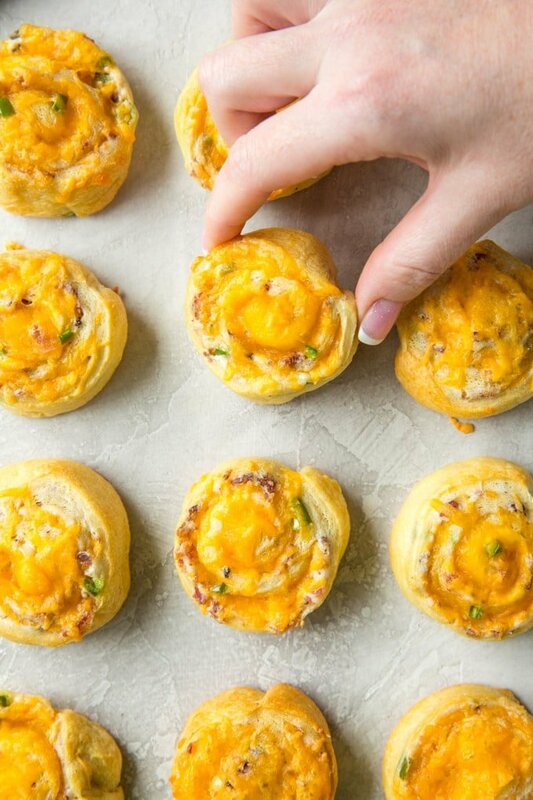 All combined with cream cheese and rolled into pinwheel form using Pillsbury crescent roll dough or pizza dough. They are similar to a jalapeno popper, and who doesn’t love those? Yes! This is a great appetizer to prep ahead of time and bake later. Spread the filling onto the sheet of dough, the roll and secure in plastic wrap. When ready, slice and bake according to the recipe directions. Start by cooking up some diced bacon until crisp, or just use the morning’s leftovers. Wait, leftover bacon? What’s that? Mix the bacon with some room temperature cream cheese and 1-2 tablespoons of diced jalapenos. Now, to be fair, I must tell you that I am a WIMP when it comes to spicy food. People usually look at me like I’m nuts when I tell them that something is spicy. 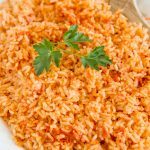 So you might like spicy and you might want to add another tablespoon. It’s a personal preference. I also used canned jalapenos rather than fresh. Again, it’s a personal preference. 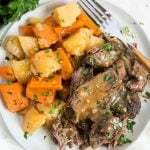 Also you’ll want to add a half teaspoon of garlic salt to season. Spread this mixture all out on the rolled out crescent dough and sprinkle with cheddar cheese and more bacon crumbles. 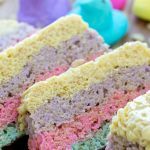 Roll it into a log and slice into even 1-inch thick pieces and lay out on a cookie sheet lined with foil or parchment paper. Sprinkle with a little more cheddar and bake at 350 for 10 minutes. PRO TIP: for easier slicing, wrap in plastic wrap and refrigerate for 30 minutes or up to 24 hours. Cut into pinwheels with a sharp serrated knife. Can’t take the heat? Add mild green chiles instead of jalapenos. That’s what I do for my kids and you get a ton of flavor without the spice. Spice it up! 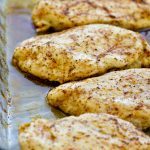 Add a tablespoon of Ranch seasoning mix or Taco seasoning to the cream cheese for a unique and savory flavor combination. Want MORE heat? Add more jalapenos and some Pepper Jack cheese instead of cheddar. 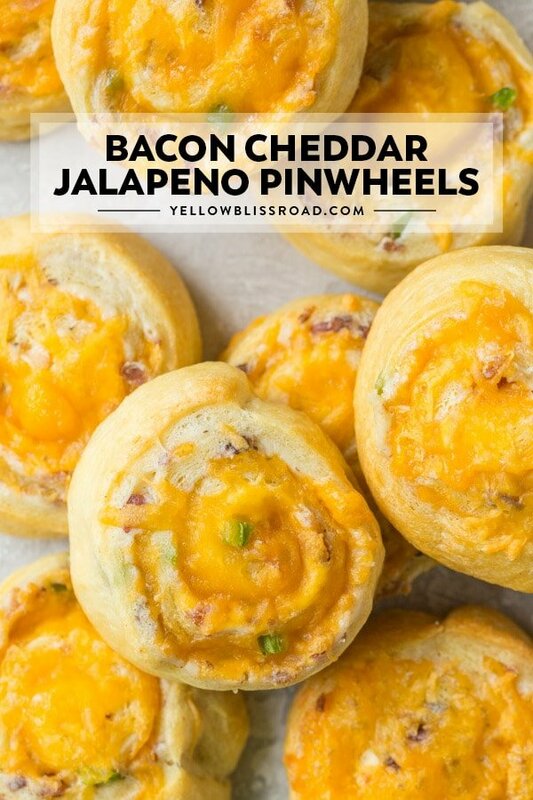 Any of these combinations would be fabulous, but I am partial to these Bacon, Cheddar and Jalapeno Pinwheels just the way they are. Don’t they look tasty? They are warm and soft and just all around delicious. They are sure to be a hit at your next party! Or maybe more baked pinwheels is what you need? We’ve got those too! 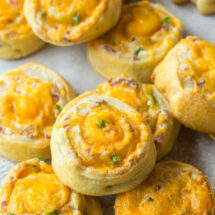 Bacon Cheddar Jalapeno Popper Pinwheels are a super simple to make appetizer that tastes just like a Jalapeno Popper wrapped in a buttery, flaky crust. Mix cream cheese, bacon, jalapenos and garlic salt together in a small bowl and set aside. Roll out crescent roll dough and lightly press seams together to form a sheet. (alternatively, you could use a rolled out pizza dough or a crescent dough sheet). 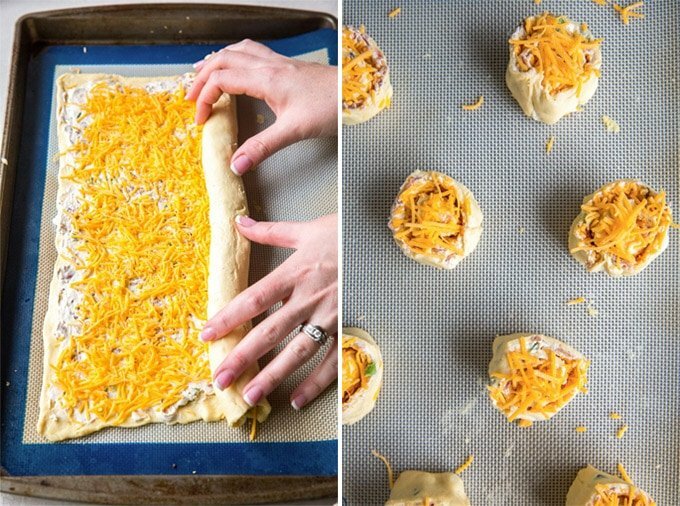 Layer ingredients evenly on the dough, sprinkle with cheese reserving about a few tablespoons for topping, and roll lengthwise. Using a shar, serrated knife, cut into 1-inch slices and place 2-inches apart on a foil lined cookie sheet. Top with reserved shredded cheddar, if desired. Bake for 9-11 minutes, or until bread begins to brown. 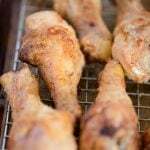 Oven temperatures can vary, so do use this time as a guideline. 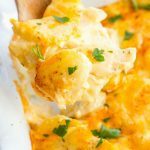 Be sure to pin this to your Game Day or Appetizer board to save for later! 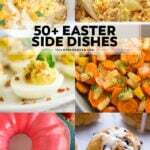 Or check out our favorite Appetizers & Dips! Yes, you could do that! You could even roll in the dough and wrap for up to 24 hours. Thank you so much, merry Christmas ?? ? These look AHHHmazing! Making them for College Game Day on Saturday. I’ve tried several recipes! And all all delightful, simple yet, complex and I’m planning on making the macaroni salad for my church this Thursday. And definitely making those zucchini chips for myself, I might share with my children ? maybe not, I myself have fried zucchini, more when I used to live in South Carolina, yet. I can’t wait to try those ! It seems so much easier than the traditional way. And less calories ? I’m definitely trying that tomorrow! 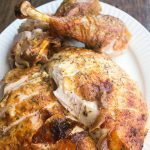 Thank you kindly for sharing your recipes and skills. And passion for tasty thing’s. It’s definitely my love language!!! I made these for a birthday brunch and everyone loved them. I used parchment paper instead of foil on the cookie sheet and baked them a little longer. Thanks for a great recipe. I make something very similar with just sausage and the crescent rolls. I wrap them in plastic wrap and freeze them until I need them. Take out a few minutes before cooking and the slice very nicely. I wouldn’t think there would be any problem freezing cream cheese, etc. Cream cheese is what binds the filling together. Have made these several times and loved them! I used the softened cream cheese with jalapeños in it. Was easy to make and delicious. I too cooked them a little longer but just waited till they browned a bit. No one in my house likes spicy anything. I’m going to try these but skip the peppers & add shredded chicken. Can’t wait to try it!